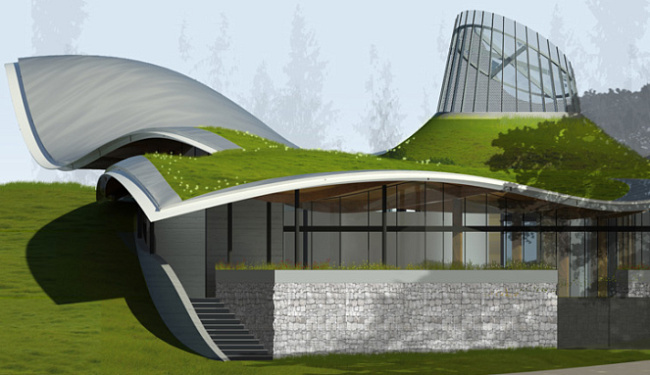 With construction already underway, the VanDusen Botanical Garden Visitor Centre in Vancouver is expected to be Canada's first certified Living Building. The super green visitor center was designed by Busby Perkins + Will to reflect the very nature its botanical gardens, and it relies on plants to amplify its green status. The building is anticipated to be completed the spring of 2011 and has been designed to LEED Platinum standards, featuring a green roof and net-zero energy consumption. The design for the visitor center was inspired by the leaves of an orchid — its wings consists of ‘petals’ that shoot off from the ‘stem’, which serve as the central atrium and lobby. The stem has been built from rammed earth and features a vaulted ceiling and roof constructed from prefab wood-glue laminated beams made by StructureCraft Builders Inc. A glass tower in the atrium infuses the center with natural daylight and also serves as a solar chimney that exhausts hot air. Grass and colorful floral bulbs will be planted on the undulating green roof, which will also direct rain into underground cisterns for use around the center. A photovoltaic system on the roof will generate electricity for the center, and hot water will be provided by a biomass boiler fed by dry wood waste reclaimed from the surrounding area. Totally off-grid, the center will provide all of its own power and will source all of its own water from rain catchment, storm water and black water recycling. Construction on the center started this past May and it is expected to be completed by March of 2011. The Botanical Garden hopes that the new center will increase the number of visitors to 300,000 people annually while providing a place for education and inspiration. The Government of Canada, the City of Vancouver, the Province of British Columbia, and the VanDusen Botanical Garden have pooled an investment of over $19.4 million to build the new center. Busby Perkins + Will has designed the center to meet the Living Building Challenge 2.0 (as per the Cascadia Green Building Council) as well as LEED Platinum standards. To receive its Living Building certification, the center will have to operate for 12 months with net zero energy while providing all of its own water. If everything goes as planned, the center could be Canada’s first Living Building. Looks great but also sounds like the perfect environment to grow mold. 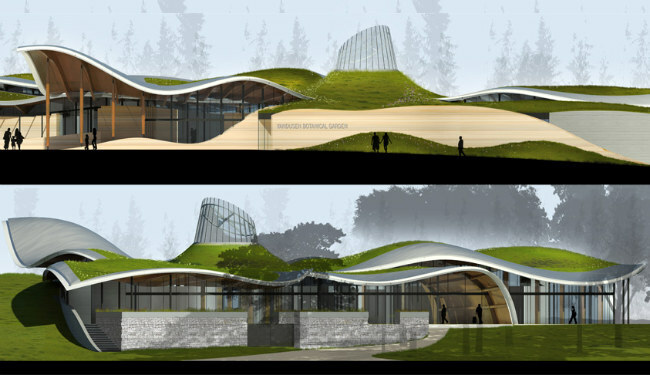 The VanDusen Botanical Garden Visitor Centre broke ground in May of 2010 and is expected to be completed by March of 2011. Designed by Busby Perkins + Will, the center is expected to boost visitor traffic by 100% and is likely to become one of the most recognized buildings in Vancouver. The center was inspired by an orchid and features 'petals' that shoot off from a central stem, which also serves as the lobby and central atrium. The roofs of the "petals" are covered in vegetation and collect and filter rainwater into underground cisterns for use in the building. The peaks of the undulating green roof will be planted with drought-tolerant plants, while the valleys will be adorned with water loving plants. Photovoltaic panels installed on the roof will provide enough electricity for the building, which has been designed with energy saving systems. All the water needs for the building are expected to be collected on-site, and blackwater will be recycled for irrigation use. Busby Perkins + Will designed the building to meet the standards of the Living Building Challenge 2.0 and they expect the center to become the first building certified in Canada. Landscaping will be provided by Cornelia Hahn Oberlander and construction by Ledcor Construction Ltd. The building will be completely net zero, off-grid, and capable of providing all of its own energy and water. 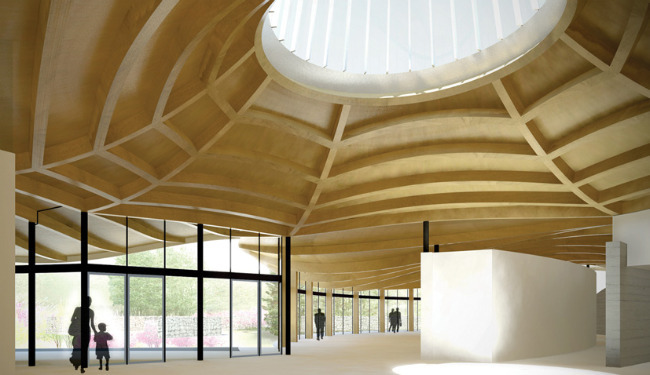 The new center will include an exhibition space, classrooms, offices, a restaurant, gift shop, library and event space. The center has also been designed to LEED Platinum standards and is seeking certification. After construction is complete, the building must operate for 12 months running on its own power and water in order to receive the Living Building certification.